Totally renovated, this first floor villa with an open floor plan make this a perfect rental for families and the beach is just steps away. The gorgeous kitchen with granite counter tops and stainless appliances is open to the dining and living areas which has a table with seating for 6. A large new sectional fills the living area and provides you with pure comfort. The master king bedroom is furnished with Tommy Bahama styled furniture, provides a flat screen TV, and has a lagoon view. The tiled private master bath features a glass walk-in shower and granite counter tops. The guest bedroom has a queen bed and one twin bed. The full guest hall bath is tiled with granite counter tops. Out the sliding doors is a private patio with 4 chairs and 2 tables to enjoy the scenery. There is also a gate off the patio that will give you immediate access to the minute walk to the beach. Along with a wide beautiful sandy beach, Island Club offers an outstanding vacation environment. Not only is it an oceanfront resort, it also offers a large pool with waterfall, a children's pool with a mushroom waterfall, and a tanning pool with lounge chairs in the pool and separates hot tub. 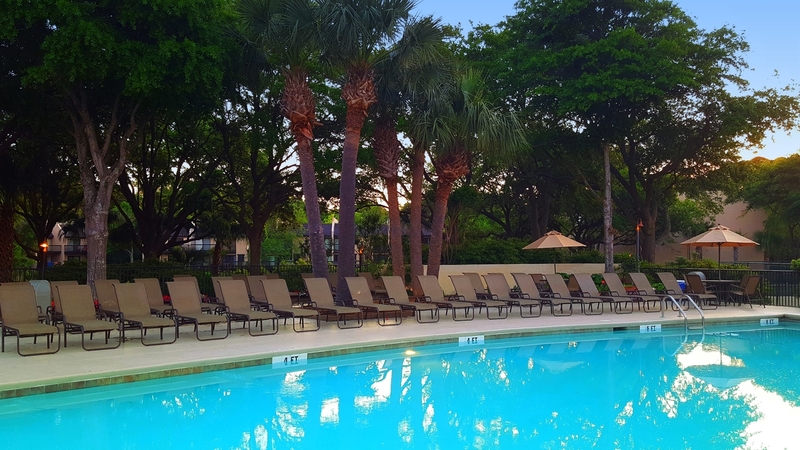 Island Club also offers nine, free tennis courts (reservations required), a pro shop, fitness center, saunas, children's playground, and outdoor basketball and racquetball courts. Children's programs are also available from June through September for ages 5-12. We loved staying in 6106 Island Club!!! This was our first trip to HHI and we were impressed!! Island Club is a hidden gem for sure!! All the amenities you need and away from the busyness of town. Everything worked perfect in the unit. 6106 was perfect for our family of 5 (including 3 teenage kids). Being on the corner first floor unit was very convenient for unloading and loading vehicle and also perfect for the less than a minute walk to the beach!!!! We had a wonderful week and would definitely come back to 6106 Island Club! !